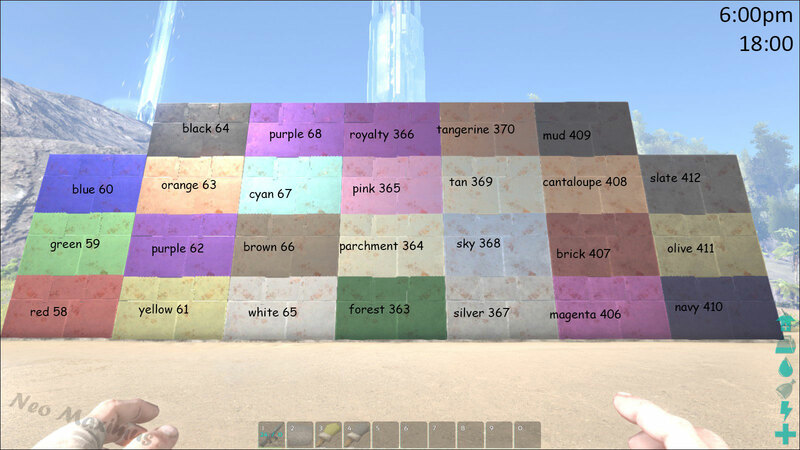 This substance can be used to color certain items and structures. Dye in ARK: Survival Evolved is used to make the world more colorful and to customize structures and items, including building parts, flags, armor, saddles, weapons, and even creatures (including yourself and other players). 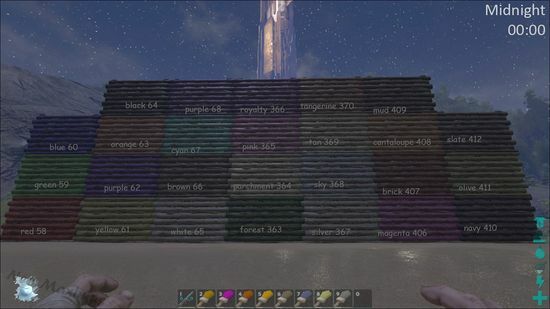 There are 25 different dyes. Dyes are crafted in a Cooking Pot or Industrial Cooker. An amount of berries depending on the desired color as listed below. After the ingredients are placed in the cooking pot or the industrial cooker, it must be lit and allowed to cook. Each batch of ingredients cooks 5 dyes. 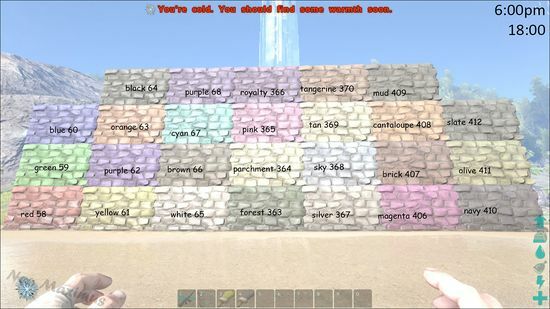 If you are making a specific dye using the minimum or more required berry quantities, and only want that one specific dye, do not put a combination of charcoal, gunpowder and sparkpowder, or more than 1 water unit in the pot. You may often get the specific dye you wanted, with any other dye possible from the mix, but not always. 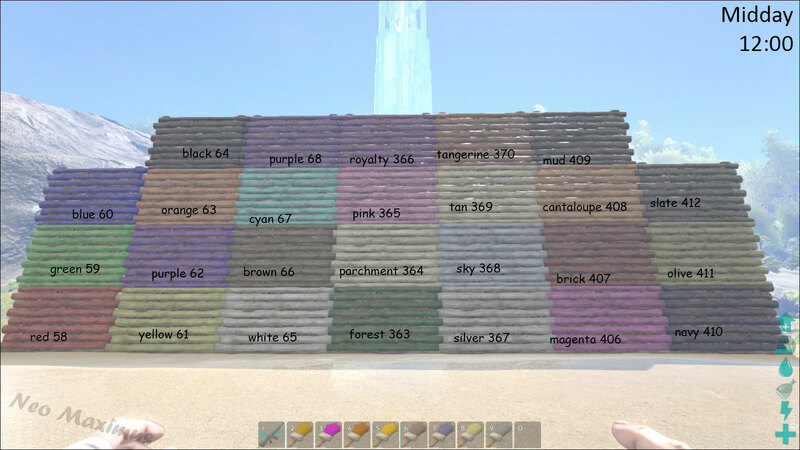 On the other hand, using different kinds of ingredients may actually be preferred by players who want a certain range in colors and don't want to make the dyes separately. A quick way to make small batches of every color assortment is to start by filling an Industrial Cooker with 6 stacks each of Berries. Ensure Water (Irrigation is preferrable) and Gasoline are available, then add 1 stack each of Charcoal, Gunpowder, and Sparkpowder, then turn on the Cooker. Wait for 24 units of Sparkpowder to be consumed (3 complete preparations), then remove the Sparkpowder. Wait for 30 units of Gunpowder to be consumed (3 complete preparations), then remove the Gunpowder. 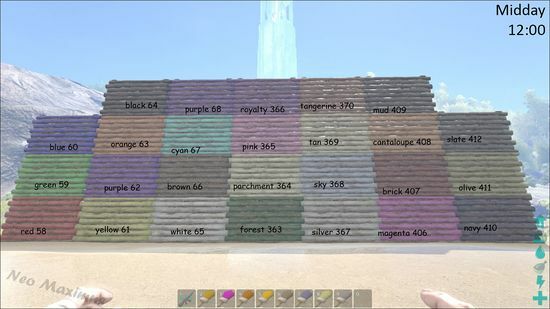 The remaining Charcoal will create the colors that are still needed (to create the following listed amounts, stop once 70 units of Charcoal have been consumed). 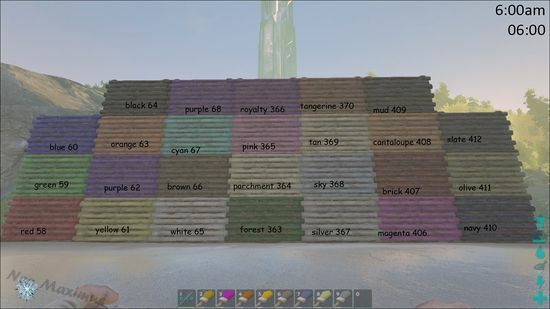 Blue, Brick, Brown, Cantaloupe, Cyan, Forest, Green, Magenta, Mud, Navy, Olive, Orange, Parchment, Pink, Purple, Red, Royalty, Silver, Sky, Slate and Yellow. And the other colors: 30 units of Black, Tan, and Tangerine; and 40 units of White. All dye-recipes on one page as PDF-file (good for printing). 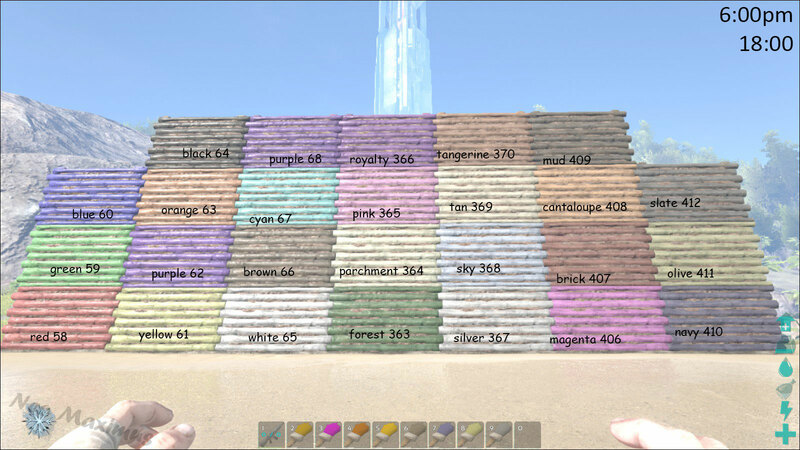 To color your items like armor, weapons, and saddles, drag the dye over the item you want to color. 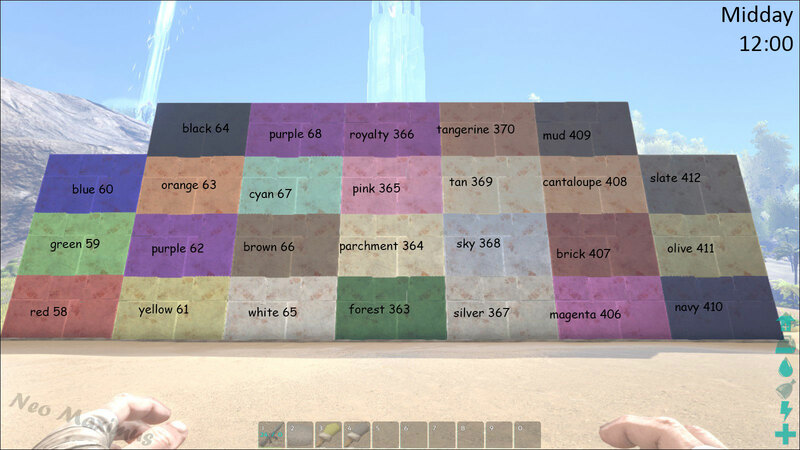 Items that are able to be colored highlighted green in your inventory as you drag the dye. 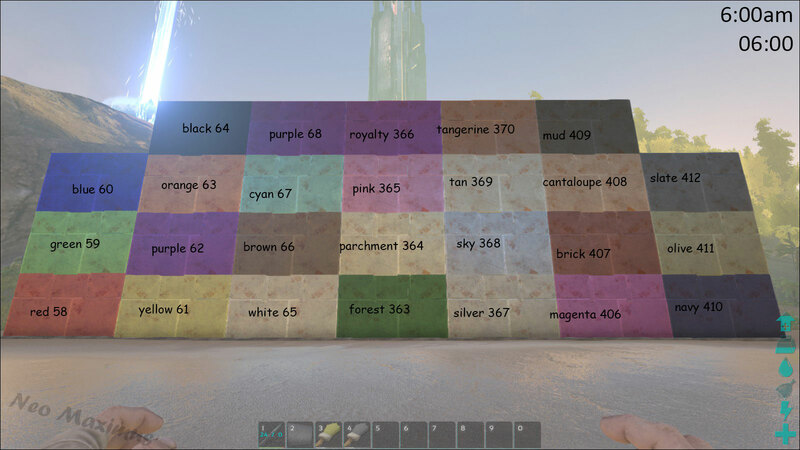 After this a menu will open where you can select the region of the item that you want to color, each region requires one dye. Coloring structures requires a Paintbrush or a Spray Painter. 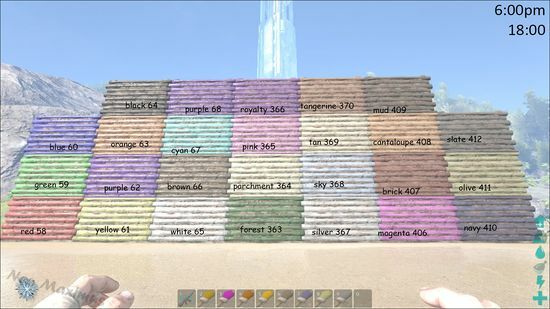 To use the Paintbrush, place the desired color onto it. 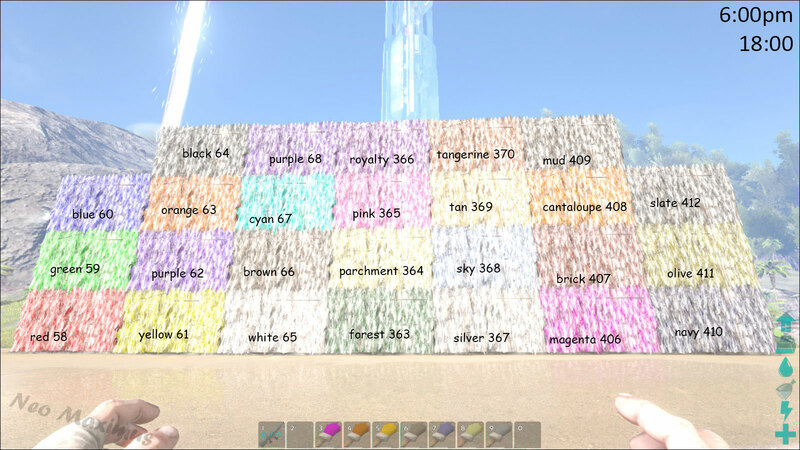 Then, you can click on the structure you want to color and again select which part of the structure you want to dye (color region). 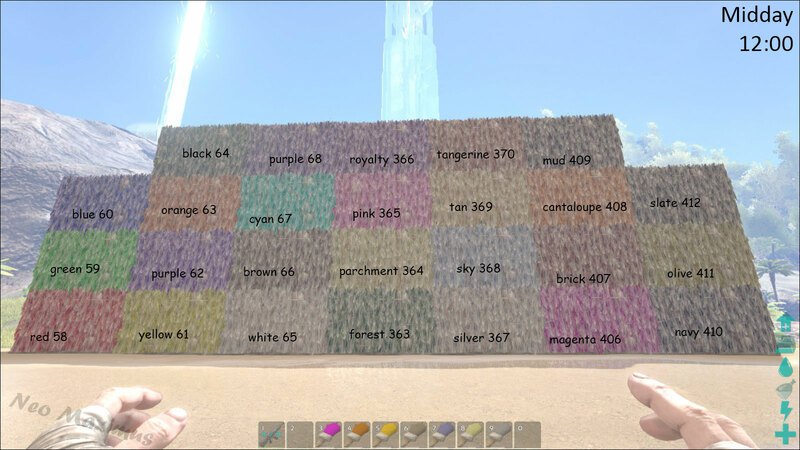 The brush contains 10 charges of the selected color, so you can paint more than one structure part with it. 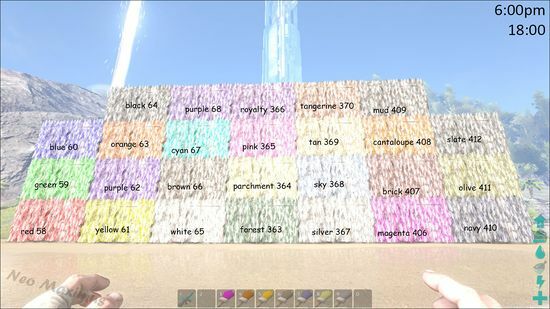 The paintbrush is also used to apply war paint to tamed creatures and players, or access the save/load images functionality. See Painting for more information. To use the Spray Painter, place the desired color into it as you do with a paintbrush. 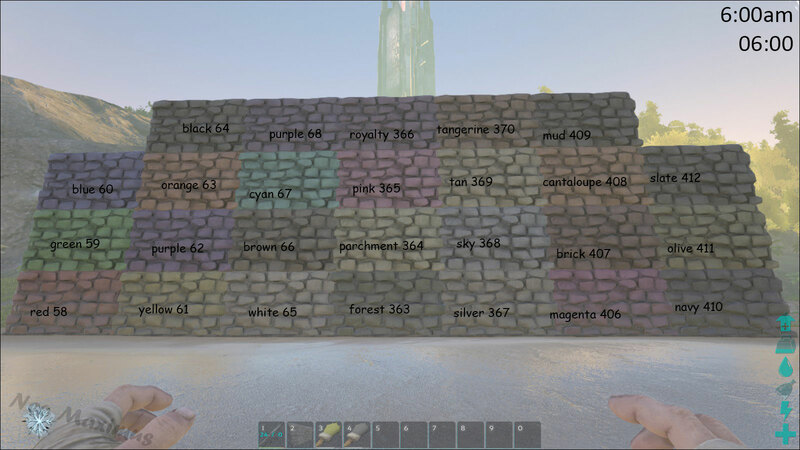 To color a structure, stand in front of it and press Left Click (PC), Right Trigger (Xbox One). 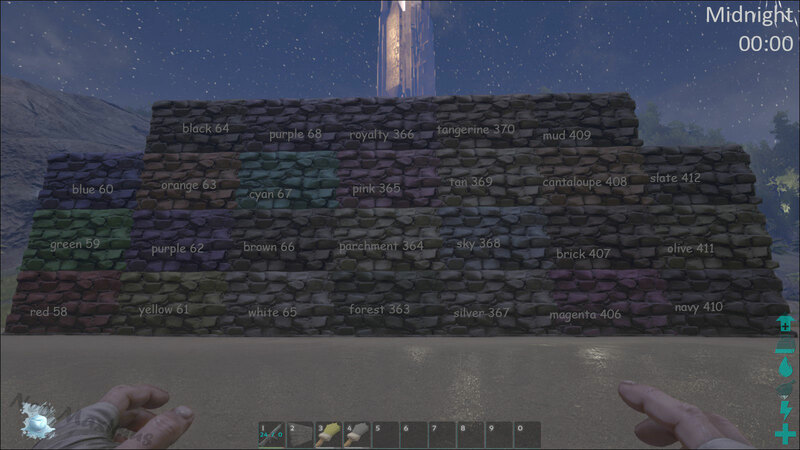 If you hold the alt-fire button Right Click (PC) and then the number keys 1-6, you can select which color region you want to dye. On Xbox, this can be done by holding Left Trigger, and pressing D Pad Up, D Pad Right, D Pad Down, D Pad Left for Color Regions 1 - 4. 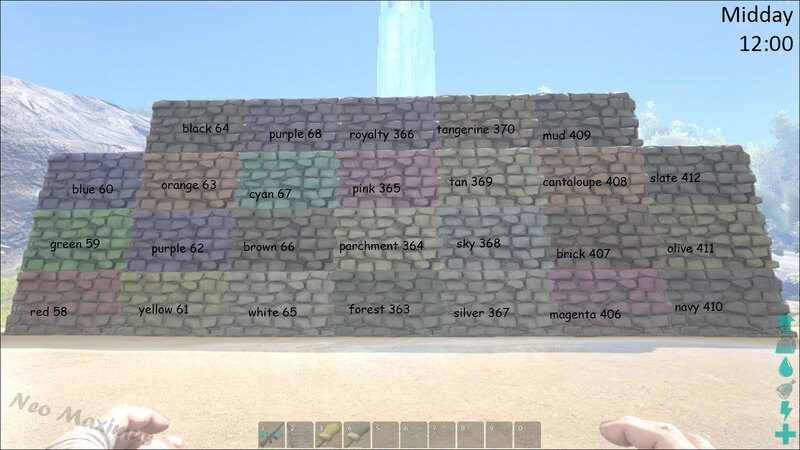 Holding Left Trigger, Left Bumper, and then pressing X or Y will enable and disable Color Regions 5 or 6 respectively. If you would like to paint your creature in ARK: Mobile, you can use Potent Dust. 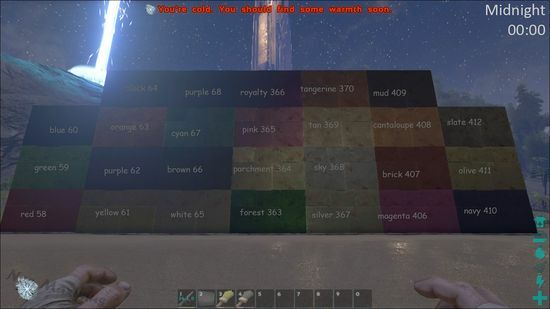 Take the dust, and apply a dye to it, then put it in your tame's inventory and click 'remote use item'. 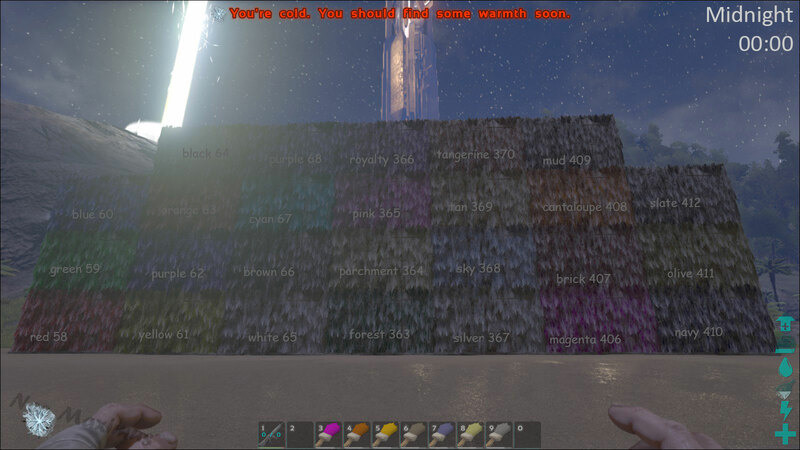 It will take a few applications to get the entire creature covered, as it seems to cover 1 Region at a time. 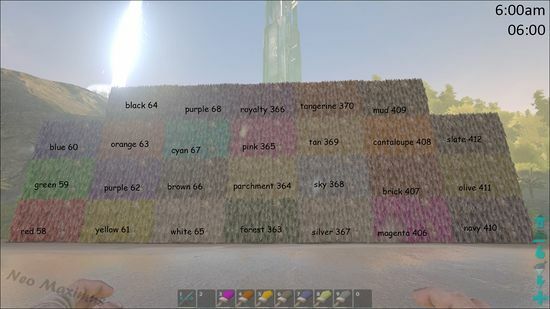 You will need a full selection of dyes to reproduce a photograph from the in-game camera onto a canvas. To remove dye use Soap. For items in the inventory drag the soap over it. For structures, use the option "Use soap to remove paint" of the radial menu (e, , ). 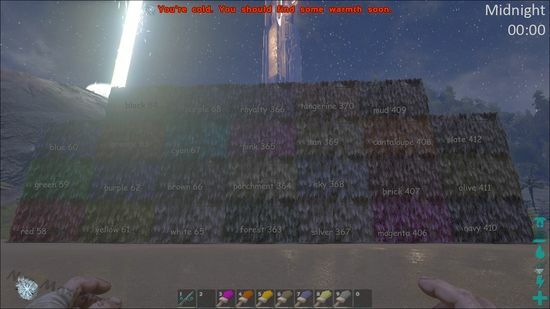 To remove dye from a creature use the "erase painting" button in the paint menu.